Simply enter your email address and price target on the form below, and we will email you the moment your price objective is reached. If the price remains at or beyond your price target, we will email you daily for two additional days. The metals market is constantly fluctuating. Various variables constantly affect precious metals prices and it’s difficult to predict when the change will happen. Current events such as systemic financial concerns, inflation, and political crises can impact precious metals prices. The same event can affect prices simultaneously, but they can also be impacted individually. Gold prices, for instance, are primarily affected by market sentiment. An obvious indication that the price of gold will change is in the strength or weakness of the United State’s economy. Typically, if the U.S. dollar isn’t performing well, prices will rise. However, if the United State’s economy is strong, prices will go down. For this reason, this precious metal is often seen as a safe-haven bid. Gold is usually a favored investment due to its ability to maintain its value and trade as a currency in times of trouble. 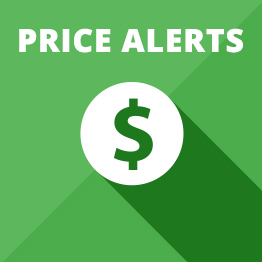 If you’d like to receive a gold price alert, simply enter your email, choose Gold as your metal, and set your target price. Money Metals will send the alert straight to your inbox. Silver’s price is affected somewhat differently than gold as it’s mainly influenced by supply and demand. This is because silver has more of an industrial demand than gold does. Manufacturers have used this precious metal for electrical appliances, technological devices such as cell phones, and even batteries. The medical profession also uses silver due to its bioactive properties. Similar to the yellow metal, silver is a desired asset to invest in, but it’s investment demand is preceded by gold and trades as such. Nevertheless, if you’re interested in monitoring this white metal and would like to receive an alert for silver prices, we’ll be more than to happy to signal you when your target price is reached. As opposed to gold, platinum spot prices will drop during hard economic times rather than rise. This reaction occurs because platinum is a rare metal with a high price. Supply of this white metal is scarce and, like silver, is demanded by the industrial sector, namely the automotive industry. In addition, platinum is mainly mined in South Africa and Russia, which can cause this metal to be quite volatile. After taking these factors into consideration and understanding that demand for this rare metal is high, there’s no surprise when it comes to its steep prices. As an investor, it’s wise to invest in this precious metal when you have the chance. If you’d like to find the perfect time to get in on this metal, we can send you alerts on your objective platinum spot price. Palladium is a metal within the Platinum Group Metals (PGMs) and behaves similarly to platinum. When industrial demand for palladium rises, investor demand also rises, which results in higher prices for the metal. Palladium is a compelling investment because it has platinum’s characteristics at a much lower price. Monitoring this precious metal’s price may prove to be advantageous. Due to the varying factors that influence the precious metals market, it can be overwhelming to follow the trends and know when the right time is to purchase a particular metal. Fortunately, Money Metals takes the guesswork out of trend following. We have a great resource that alerts investors when their metals’ prices have reached their target. It’s easy, quick, and free!